As a part of its commitment to the United Nations Framework Convention on Climate Change (UNFCCC), Timor Leste is now in the process of developing their Second National Communication (SNC) as an update of the status of emission and steps taken to achieve the objectives of the convention (mitigation and adaptation) and needs for financial, technology, and capacity development which has been reported in its INC in 2014. Center for Climate Risk and Opportunity Management in Southeast Asia and Pacific (CCROM-SEAP) Bogor Agricultural University, acts as the international consultant the development of Timor-Leste’s SNC, has conducted their third mission on 9 – 13 October 2017, which intended to conduct a capacity building activity which focus on the chapter of Climate Change Mitigation. 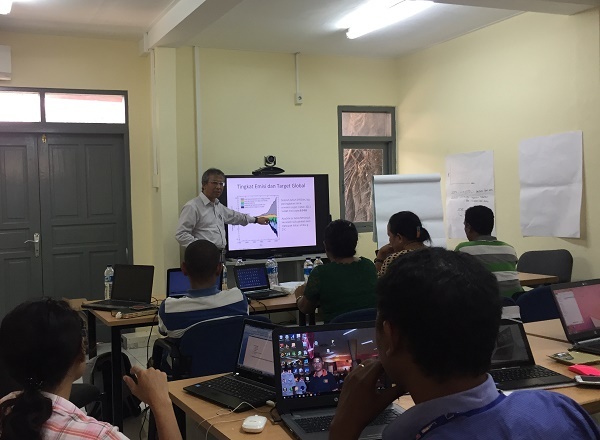 The main objective of this activity was to to conduct a training on Mitigation Option Analysis and gather primary activity data from different sectors. The focus of the training was on technical aspect, i.e. introduction of method and tools for Mitigation Option Analysis and practical on the use of the methods and the tools for the climate change analysis. The training was also expected to enhance the capacity of TWGs member in ensuring the implementation of mitigation assessment, supporting and facilitating related national institutions in developing climate change mitigation policies and program taking into account the INDC of Timor Leste. The capacity developed as a result of this training will be useful in the effort of involving active participation of the TWGs in developing the mitigation chapter of the SNC.